In October of last year, Finland’s oldest annual book fair brought together a total of 700 performers, 500 book releases, hundreds of stands, a plethora of publishers, and tens of thousands of literary fans. Visitors had the opportunity to attend panel discussions, browse new books, and meet with authors. Even though the Turku Book Fair is not an “industry fair” in the direct sense, the event is a fantastic opportunity for open-format meetings between individuals involved in literature and culture. Turku itself is an intellectual environment, an academic hub, Finland’s historical capital, and host to a vibrant cultural scene similar to those of Uppsala or Tartu. The 2018 Turku Book Fair celebrated the centenary of Finland’s southern neighbor with a rich Estonian-themed program. Visitors to the Estonian stand were able to purchase Estonian books translated into Finnish and expand their knowledge of the country. The children’s area of the fair was taken over by Ilon’s Wonderland – a children’s gallery, museum, and activity center located in Haapsalu, Estonia, which was inspired by the renowned illustrator and Estonian émigré Ilon Wikland. In late 2016, Estonia received a proposal to be the guest of honor at the 2018 Turku Book Fair as part of its centenary celebrations. Estonia’s organizing team, which included the Embassy of the Republic of Estonia in Helsinki, the Finnish Representation of the Estonian Institute, and non-profits, which included the Association of Estonian Societies in Finland and the Tuglas Society in Finland, got right down to work drafting an engaging, wide-ranging, and jam-packed program worthy of the status. From the very beginning, the most important task facing the team was to encourage Finnish publishers to release new translations of Estonian works for the occasion. Translations are not necessarily a very profitable business these days, of course, but it was clear that building a rich book fair program around equally rich translations would be a very sound approach. Knowing the relaxed tempo of Finnish publishers, we were in quite a rush from day one. We still had to keep Estonia’s special status a secret but were able to use this information to exert some gentle influence from the background. Our first step was to organize an Estonian literary event for Finnish publishers and translators in early 2017, at which we introduced works for potential translation, the Estonian Literature Center’s database, Traducta grant opportunities, and other support measures. We also brought two key groups together – translators and publishers – in order for them to establish useful direct contacts and have one-on-one conversations, something that is difficult to achieve in Finland, as publishers usually negotiate with literary agents when commissioning translated works. Your average Finnish publisher might not be aware that there are no agents on the Estonian book market and copyright talks are usually held directly with the authors themselves. The book fair team thus tried to extend a helping hand to both publishers and translators in the relay race. The effort was a success: in 2018 alone, a total of eight Estonian works of fiction, one memoir, four children’s books, and one nonfiction work were published as Finnish translations. An array of “new” Estonian authors were introduced to Finnish readers: Kai Aareleid (Burning Cities), Andrei Ivanov (A Handful of Dust), Indrek Koff (On the Energy of Estonian Essence), Kairi Look (The Airport Bugs Fight On), Paavo Matsin (Gogol’s Disco), and Valdur Mikita (The Art of Listening to Chanterelles). Such a sizeable and significant portion of Estonian writing published all at once as Finnish translations was the turning of a new page! In addition to the newcomers to Finnish translation, several familiar faces also took the stage at the fair: Kätlin Kaldmaa, Jaak Jõerüüt, Kauksi Ülle, Mika Keränen, and Asko Künnap. Another interesting aspect of the year was that Finns themselves published 11 books on various Estonian topics including the country’s history, ghosts, jokes, military uniforms, and steamboats. A Finnish novel about the collective-farming era on the Estonian island of Saaremaa was even published. The connection between the two neighbors is very close, indeed. The program for the Turku Book Fair was drafted in cooperation with the chief organizing team, which included several different creative unions and publishers as well as language teachers, libraries, and museums – a couple dozen organizations in total. Every year, a specific topic is put in the spotlight at the fair. In addition to Estonia’s special status, overall environmental awareness, and the painful Finnish Civil War of 1918 were in focus. Members of the chief organizing team discuss these topics in cooperation and determine the fair’s program accordingly. As such, other institutions also organized Estonia-themed panel discussions: as was done by the University of Turku, the Finnish Reading Center, the Finnish Library Association, and the Finnish Association of Translators and Interpreters. The final tally came out to an unprecedented 34 on-stage discussions; for comparison, in an ordinary year, the fair sees an average of only three to five! The long-awaited weekend finally arrived. Setting the tone for the opening day were 4,000 local teenagers drifting around the expo hall under the supervision of their Finnish-language teachers. Their task was to find answers to a list of literature-themed questions. Young readers visited the Estonian stand to find out how old the Estonian state had turned as well as the titles and authors of the works that were translated into Finnish that year. Speaker of the Estonian Parliament Eiki Nestor gave an opening speech and was gifted one thousand pine and fir seeds. Since environmental awareness was a central focus of the 2018 fair, visitors were also given seeds in the hopes that new trees would be planted for making future books. The fair’s program director, poet and First Lady of the Finnish Republic Jenni Haukio, voiced her hopes that a “park of books” might flourish in Estonia from the seeds given at the event. 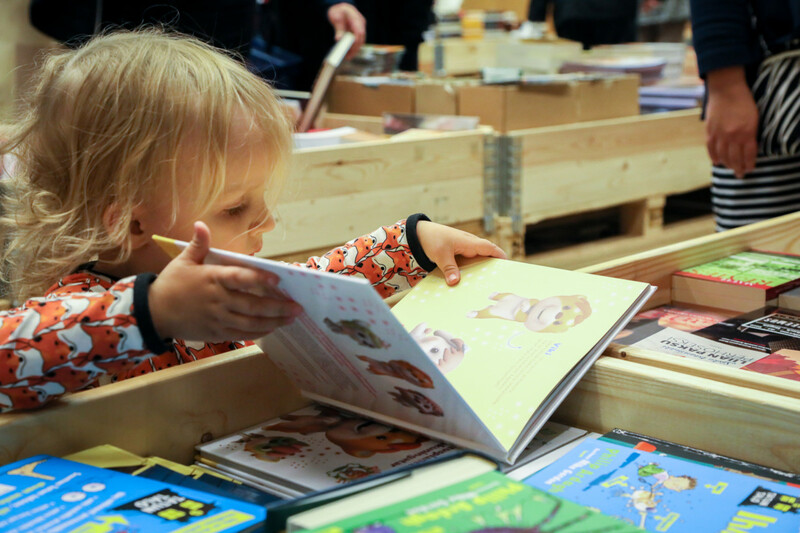 Altogether 21,500 people visited the 2018 Turku Book Fair. Appearances by Estonian writers were well-attended and received gushing praise. We can state with pride that the Estonians truly fascinated the Finns! One audience member even proposed making Estonia every year’s guest of honor. I must note that the fair’s professional moderators – TV journalists who were able to hold engrossing 20-minute on-stage conversations – were invaluable in provoking public interest during the Estonian-themed discussions. We also invited locally-renowned Finnish writers to chat with their Estonian colleagues: Rosa Liksom spoke with Paavo Matsin about using Russian topics as literary material, Venla Hiidensalo and Kai Aareleid discussed silenced family stories, and the ethnically Kosovan Finnish author Pajtim Statovci spoke with Andrei Ivanov about societal outsiderness. The Finnish media likewise took an interest in the Estonian writers on hand. In-depth articles were published about many, and the fair received wide media coverage all around Finland. Estonians could be seen on television, heard on radio, and read about in newspapers both locally and nationally. The Turku Book Fair shaped up to be one of the most predominate Estonian centenary events in Finland. Starting with the press release on Estonia’s honorary status that was sent out in October 2017, we received media coverage multiple times in cooperation with the expo center’s information campaigns and were thus given an invaluable opportunity to speak about literature and Estonia’s centenary in general. The Turku Book Fair’s guest of honor is showered in public attention while in the spotlight, but it’s also natural that this fades and the situation returns to normal after the event wraps up. Nevertheless, it appears that the focus Estonia enjoyed during the fair is showing no signs of decline. Finnish publishers are demonstrating an ever-deeper trust in Estonian literature. Last year, translation contracts were signed for six Estonian works of both fiction and nonfiction that will be published this year. No doubt more will be added to the list. Sanna Immanen is a translator and the director of the Estonian Institute’s branch in Finland. She also raises fine wooly sheep.